Planning a travel wardrobe can be tough. 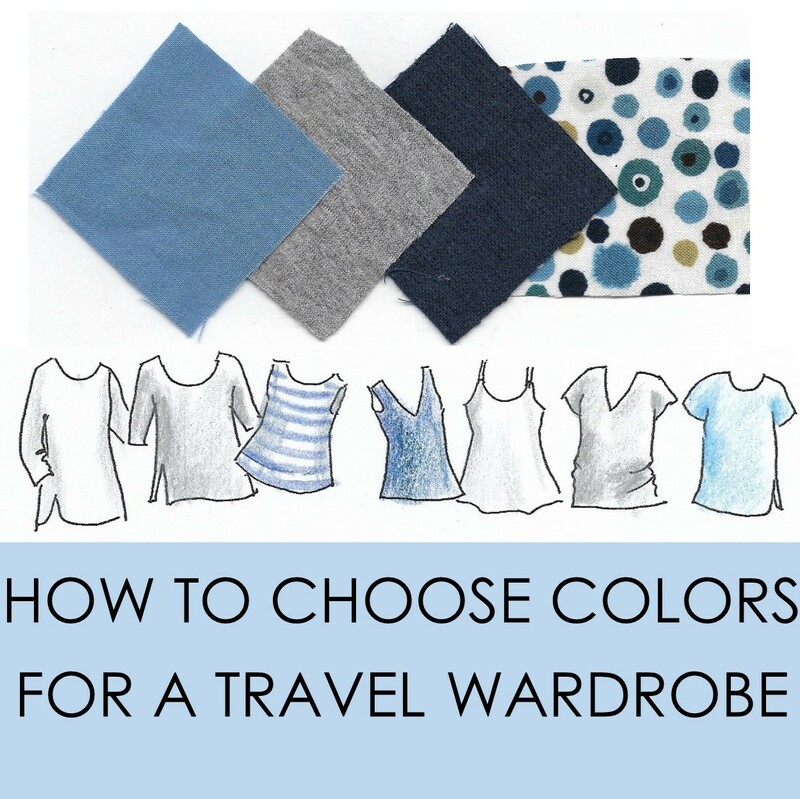 Knowing what colors to pack and figuring out how to make it mix and match easily can be hard to do. By using warm or cool colors to create a capsule wardrobe you can make it coordinated and easy to wear. Wardrobe planning can be complicated, but by starting with a specific color group, it's possible to put together a simple but effective travel wardrobe where all of the pieces can be worn together and you are't taking pieces that you can only wear once. To show how this works, I have assembled a basic wardrobe for traveling. To make it easy, I start each color group with a fabric print that will be included in the wardrobe. 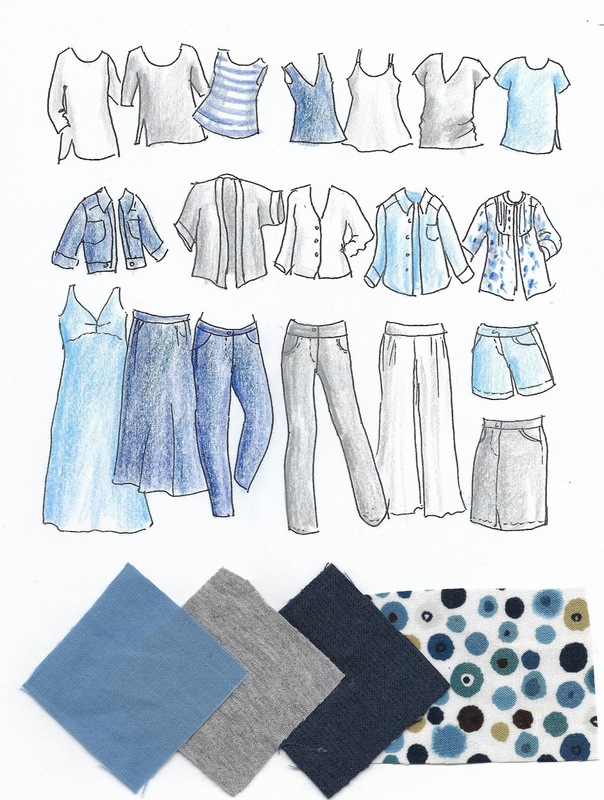 For a solid color wardrobe, it's still possible to select colors using a print or artwork as inspiration. Warm or cool colors, which to choose? Based on skin tone, eye color and natural hair color, most people prefer either warm or cool colors. By checking your closet you should be able to see where your favorites are. These are also the colors people will compliment you when wearing. Start with a fabric print that is very specific to your favorite color group. Also try to seek a print with colors that are unifed in their brightness. Are these colors soft and muted or high contrast and bright? 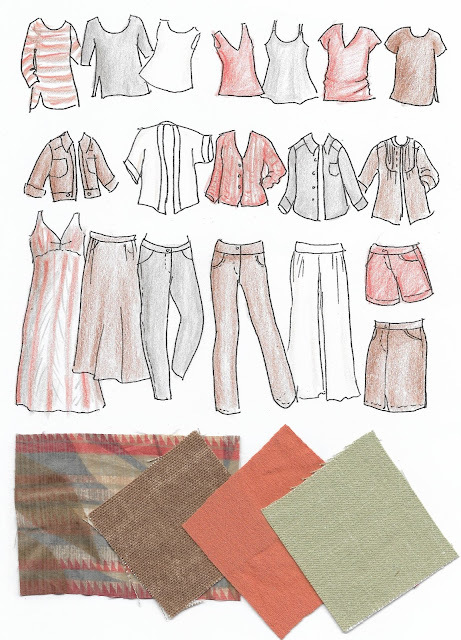 The design of each garment is only a suggestion, and is meant to show samples of the wardrobe. Everyone should work with silhouettes and styles that are what they like to wear. 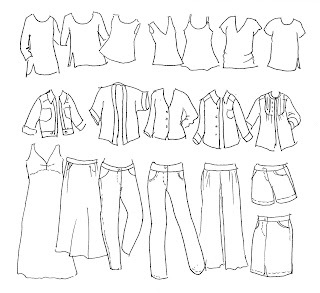 For the basic garments, I have the following items. After determining the pieces, the fun part is choosing colors. 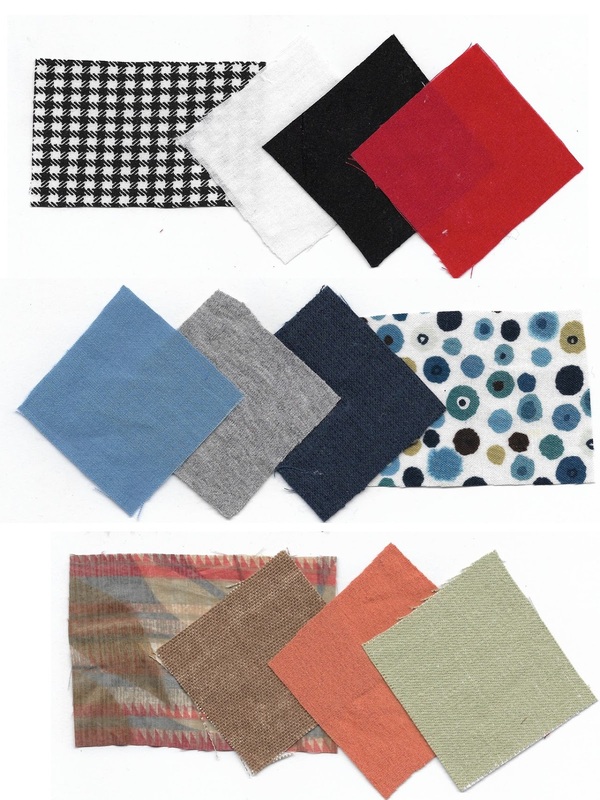 Using the fabric print that contains only cool or warm colors, select your favorites. I use only a few colors. Having both a dark and light tone to start is easiest, then add an accent or two. Cool colors, Muted tones: This first sample shows a dotted print fabric that has cool colors. These are not bright, but rather are muted or soft. Light blue, gray and dark blue are used with the print. Each pant shows one of the colors, and the tops do this as well. Doing it this way means that the pieces will 'mix and match' easily. There isn't any fashion here that won't work into the wardrobe. Warm colors, Muted tones: This group has a print that includes desert colors of warm brown, terra cotta, warm white and clay. Cool colors, Bright tones: The print here is a black and white check, so an additional high contrast jewel tone red is added to the black and white color group. 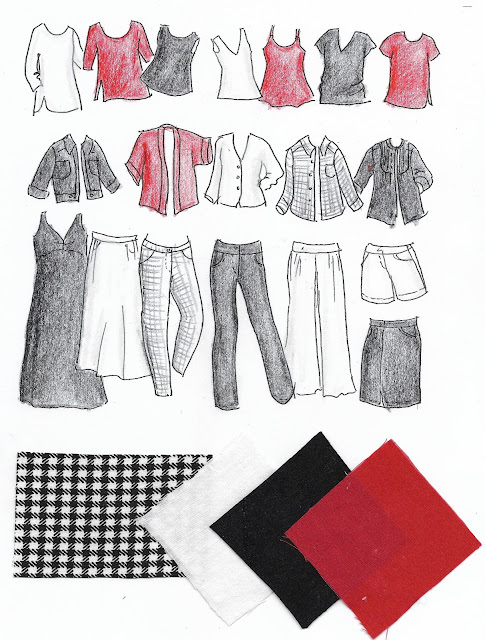 This accent color is used only in the tops, keeping the pants, skirts and shorts in black or white. These wardrobes show how it's possible to create a capsule wardrobe for travel with fashion pieces that are easily worn together. 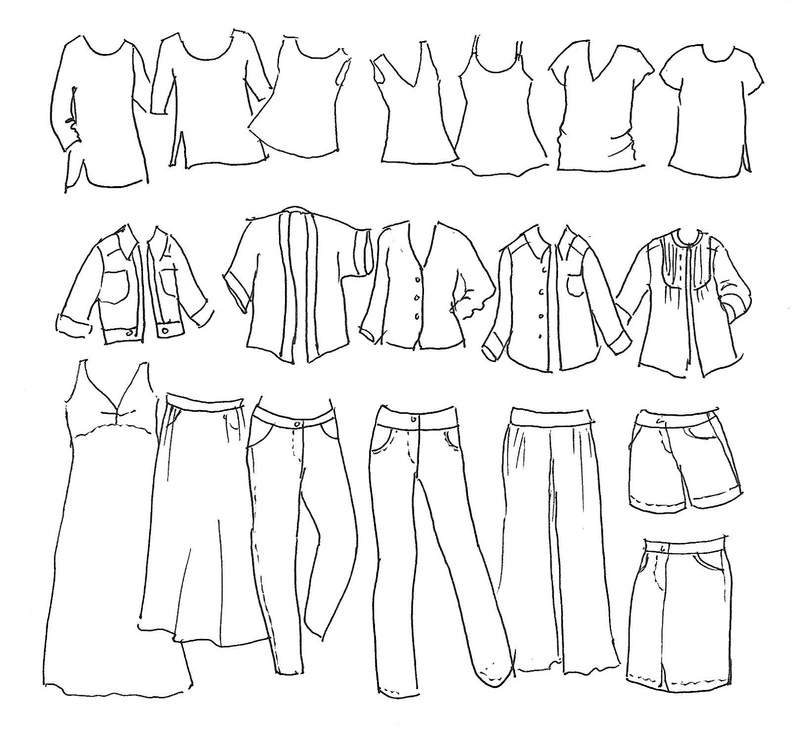 By planning your items carefully, it's possible to have a wide variety of outfits from a limited number of garments. This post is the related to the previous article I wrote; "Color Selection: Warm and Cool Color Groups". In that I show examples of these color concepts. 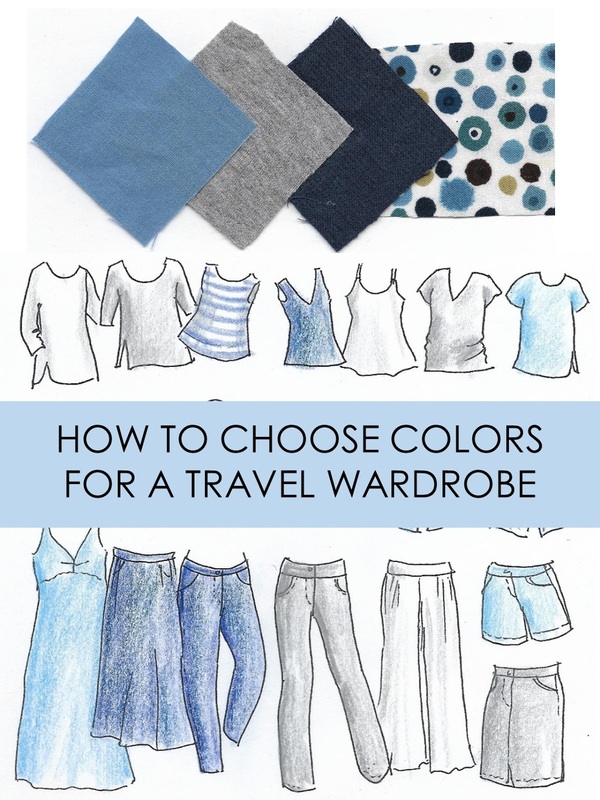 You may want to read that article first to get a better understanding of color selection used here to build a wardrobe. Have fun mixing what pieces you may already have using a warm or cool color group. You may find that adding only one or two new pieces will create a great capsule wardrobe to take with you on your next trip.